Undersea volcanoes might be more common than previously thought | Watts Up With That? Excellent 3D graphic representation of the lava. Note this particular volcano was previously report by Scarlet- yesterday. “An undersea volcano has erupted off the coast of Oregon, spewing forth a layer of lava more than 12 feet (4 meters) thick in some places, and opening up deep vents that belch forth a cloudy stew of hot water and microbes from deep inside the Earth. 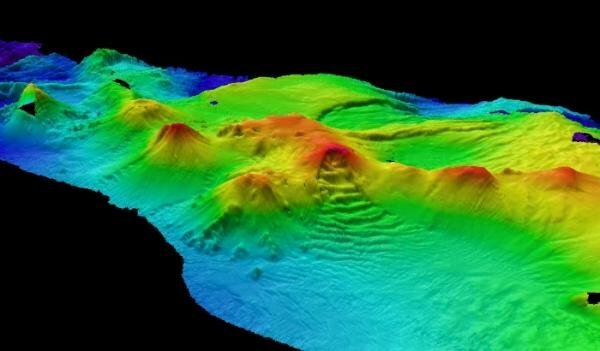 A British research team has discovered a chain of 12 undersea volcanoes near the remote South Sandwich Islands in the southern Atlantic Ocean. It is the first group of large undersea volcanoes ever found in the Antarctic region. Scientists from the British Antarctic Survey (BAS) say that seven of the massive volcanoes are still active. Some of the mountain peaks rise three kilometers above the ocean floor, nearly tall enough to break the water’s surface. The collapsed craters of others measure five kilometers across. August 11, 2011 in Vulcanism. I wonder how many underwater volcanoes are down there and how much do they add to the overall water temperature. Just maybe the co2 in the oceans is rising because more undersea volcanoes are going boom, just like the ones above water? So, volcanoes, undersea, erupting, they’re large, spewing all sorts of under ground crap like CO2 (used to be called the Carbon Cycle in my day) & microbes??? There are dozens of them, they’ve only just been discovered? They’re hot giving off large amounts of undersea heat? And here I am thinking Earth sciences are settled science with NOTHING left to discover, ever! I don’t suppose they just happen to lie around the West Antarctic Penninsula or could possibly affect the ocean temperatures locally at all, causing the water to be enriched by life that those whales & all the other sea based life forms seem to like so much? ;-)) Anyway it is an interesting post. “Chadwick and colleagues have been keeping tabs on the peak since it last erupted in 1998. Thanks to a monitoring system they developed to measure the mountain’s minute movements, the team predicted the volcano was due for another eruption sometime between 2011 and 2014. And with billions of tonnes of lava being extruded onto the sea floor plus the heat both direct and indirect this is bound to have and effect on sea levels, not to mention sedimentation from the big rivers. Interesting but not unsurprising considering that we know more about the far side of the moon than the ocean’s floor. It is thought that the ridge system, constructive plate boundaries, contains 1million active volcanoes. The South sandwich Islands are part of a subduction boundary that has formed the island arc which will be volcanically active. So these undersea volcanoes should not have been a surprise to a Geologist. It is my understanding that, by studying the read-out from a seismigraph, you can determine the cause of an earthquke. This might be a dip-slip faualt, strike-slip fault, subsidence, or volcanic eruption. I think therefore that it is unlikely that a volcanic eruption would go unnoticed, wherever it was on the globe. How much do undersea volcanos contribute to Ocean acidification? If it is a significant amount, how do these animals that thrive near vents and have a calcium carbonate shell survive? in fact the warming effect of volcanoes seems to look very similar to that of man made global warming. Are they sure this is a volcano? Maybe it’s a Soviet era sub with a caterpillar drive commanded by a Lithuanian captain with a Scottish accent? SteveE, since they’ve discovered the Oregon eruption recently, then clearly it’s more common than we thought, by at least 1. Hope not. Jack Ryan is fat, stupid, and ugly now. Liquid CO2? am i missing something???? No, they were surprised to see that it had erupted, not that it was there. Like they said in the article, they’d been monitoring it since it last erupted in 1998 and predicted a eruption sometime between 2011 and 2014. They don’t, they been erupting for millions of years and so are nicely in equalibrium. An event like the Deccan or Siberian traps eruptions might have an effect, but that’s certainly not happening at the moment. I suspect that volcanoes are highly variable in the amount of CO2 they produce. The undersea ones are likely not gassy depending on the magma source. Perhaps there are unusually few undersea volcanoes erupting at present. Could that be why I am so damned cold? There is a sentence you will never see in the New York Times or the Washington post. With large subsurface eruptions one would think that scientists would be measuring the dispersion of heat, CO2, etc as it was dispersed from the volcano. There should be no need for conjecture. For a given type of eruption with a known size, it should be relatively easy to `model’ the effects. At worse, the model results would be as accurate as the climate models. I guess that carbonate shelled critters near black smokers, etc have adapted biological mechanisms to cope with increased (?) acidity. Thanks for the laugh, metryq. The word microbes is especially interesting, because it shows that SOME sciences are capable of changing theories in response to facts! Not too many years ago, microbes wouldn’t have been mentioned, because nobody thought they could live in volcanic rock. Even if they had been observed as part of the upflow, scientists would (quite reasonably) assume that they had been in the ocean already. I’m very interested about the microbes part. I’d like to know more. One of the most interesting places on earth (it would make a great location for an Evil Genius base) is the Australian Territoy of Heard Island – http://www.heardisland.aq/about . in 1992 the Volcano that is also Australia’s highest point erupted – destroying all vegetation on the island, but since then the volcanoe has continued to erupt whilst the vegetation and fauna has returned. The local climate on Heard Island is significantly influenced by the islands perennial ice cover and mountainous nature, particularly the orographic effects of Big Ben on precipitation, snow accumulation, winds and cloud cover. The relatively low-lying McDonald Islands are free of permanent ice and, while windy, do not experience the highly changeable conditions of Heard Island. Meteorological records at Heard Island are incomplete, but there is considerable evidence that the local climate is changing. Observations at Atlas Cove indicate an increase in average annual air temperature of almost 1°C between the periods 1948-1954 and 1997-2001. This mirrors similar changes interpreted from observations at nearby Îles Kerguelen and elsewhere in the southern Indian Ocean. These increased temperatures are having a significant effect on the Heard Island environment, with glacial retreat leading to the formation of lagoons and freshwater lakes, and exposing new land for colonisation by plants and animals. The maritime setting of the islands leads to low seasonal and daily temperature ranges, persistent and generally low cloud cover, frequent precipitation and strong winds. Monthly average temperatures at Atlas Cove (at the north western end of Heard Island) range from 0.0° to 4.2°C, with an average daily range of 3.7 to 5.2°C in summer and -0.8 to 0.3°C in winter. Air temperatures at Spit Bay, only 25 km to the east can be remarkably different, with monthly mean temperatures being as much as 1.3°C higher. The winds at Heard Island are predominantly westerly and persistently strong. At Atlas Cove, monthly average wind speeds range between around 26 to 33.5 kilometres per hour. A maximum daily wind gust of greater than 180 kilometres per hour has been recorded on several occasions. Annual precipitation at sea level on Heard Island is in the order of 1.3 to 1.9 m (water equivalent – some precipitation is in the form of snow), and records taken during the 1948-1954 ANARE expedition show precipitation occurring on 75% of days. The high relative humidity at Heard Island (mean >80% year-round) together with the mountainous topography and strong winds, result in persistent cloud cover and often-spectacular cloud formulations, such as cap, lenticular and rotor (collectively wave clouds) commonly observed over and downwind of Big Ben and to a lesser extent Laurens Peninsula. Atlas Cove, at the north-western end of the island, experiences significantly greater cloud cover (average 7.3 octas, where an octa equals one eighth of the celestial dome) than Spit Bay at the eastern end, in the lee of Big Ben. I wasn’t aware the oceans were acidifying. Did someone finally overcome the various buffers in the mix to change the ph? I wish people would quit with the “acidifying the oceans” rubbish until they can show that the ph has moved enough to be detected. As soon as it stops erupting I’m going to apply for the carbon credits. Most of the moutain-like volcanoes have been discovered. How often they erupt is another thing all together. Stove pipe vents are not easily discovered. Nor how often they erupt. We don’t know very much about these processes because we don’t monitor the ones we know about on a daily basis, nor have we mapped the entire ocean floor for vents. That’s a very nice slump down the side of the volcano. Bloke: when you get back from the pub, look up “focal plane solutions”. Yes, from the worldwide seismograph network, you can determine the nature of earthquakes. The system was originally set up to monitor USSR nuclear tests, and can distinguish between earthquakes, nukes, and eruptions. While you’re at the bar, make mine a pint of Sam Smiths. Cheers. Well, Bloke, you’re partially right, even with your incomplete list of things that go bump. The mid-ocean ridge system is some 40,000 miles long, and its constructive processes of spreading and extrusion are somewhat aseismic when compared to other volcanic processes. Seafloor spreading happens in the manner of a conveyor belt moving in opposite directions from a very hot and somewhat ductile extrusion centre. The seismicity associated with seafloor spreading is mostly concentrated on the transform faults that connect ridge segments, not the ridges themselves. The axis of the spreading centre accretes by ‘sheet dikes’ (resulting in the famous symmetrical Vine & Matthews magnetic reversal stripes). The eruptive expression of seafloor spreading takes the form of the ‘black smoker’, vents of superheated sulphide-and-dissolved-gas-rich water which issue from the ridge axis, superheated by the rising basaltic magma. These are the things that are likely to be more common than one may think. Iceland lies astride the Mid-Atlantic Ridge, anomalously a large accumulation of basaltic lavas which rises above sea level. Regardless of its origin, this large accumulation of lava ‘corks’ the underlying magma chambers, resulting in more typical ‘conventional’ vulcanism replete with things that go bump, and gloriously punctuated by the fact that all of this goes on under immense mountain glaciers. The same ridge segment responsible for Eyjafjallajokull is also responsible for the new island of Surtsey which appeared in 1963. Something, perhaps a mantle plume or hotspot, is responsible for the extra-effusive nature of seafloor spreading around Iceland, but in general, the mid-ocean ridges quietly spread, and most likely do so along most of their length…contributing a mighty load of highly acidic, CO2 & Sulphide-rich soup to the oceans every day, as they probably have for time immemorial. And that, folks, eclipses any “assification” derived from an atmospheric trace gas. Sorry, Julia, you make it too easy. The “settled science” of climate ignores the fact that we have no idea how far the oceans of the earth extend below the bottom of the sea floor into the crust and mantle of the earth, or how much heat is contained in this hidden water, of how much heat exchange there is with the ocean water. We recognize that soil is porous and that whenever the water table exceeds the height of the land we get springs, rivers and lakes. Somehow it escapes us that on a larger scale, that the bottom of the oceans are porous. That we have oceans because the crust and mantle are saturated with water to the extent that the excess forms a global water table that rises above the level of bottom of the ocean basins. As such the oceans of the earth may only be a fraction of the total volume of water on earth, with most of the water on earth lying below the level of the oceans withing the crust and mantle, to a depth were the internal heat of the earth matches the boiling point of water at pressure. How much life exists deep below the level of the ocean floor, fed by the energy within the earth, we are only beginning to understand. Quite possibly this is the life that reestablishes life on the surface, each time mass extinction events wipe out all surface life. Undersea volcanoes have been known by geologists for well over a century. Iceland, Hawaii and a host of other islands and terrains are born of undersea vulcanism. I mapped “pillowed” basalts in the Archean of the Canadian Shield over 50 years ago myself and these are 2.5-3.0 billion years old. Click on the images on the right for modern Hawaiian pillows and for ancient precambrian pillows in the Canadian Shield. It is a common thing among scientists these days to be “rediscovering” well known phenomena and finding them much more prevalent “than thought (by themselves)”. Thought seems to be of declining interest. If they go for the Nobel Prize, I might try to horn in on it for my prior work but of course there will be another 20,000 geologist in line. They were also reported by WUWT some time ago. Indeed the most common rocks on the Western Peninsula are volcanic rocks. Wonder how many there are around Mauna Loa, if they’re all known and activity monitored to apply sensitivity to the CO2 monitoring there. @A: Liquid CO2? am i missing something???? CO2 liquifies at relatively low pressures. Make that three, one for yours truly & one for Gary Pearse:-) I was being sarcastic when I made that comment Gary, but thanks for the links anyway! The density of liquid CO2 is 1.03 vapor pressure at 20 °C is 57 bar, lower pressure at lower temperature. The liquid would be somewhat stable below 500 to 600 m, depending on temperature. The density of deep ocean water can be around 1.05, so liquid CO2 would be able to rise. Barely. I enjoyed seeing liquid CO2 in a very small sealed clear plastic centrifuge tube (used for 100,000 g) partially filled originally with dry ice. It didn’t last long after the internal temperature rose above 0 °C. It was put in an empty fume hood and viewed behind a plexiglas shield. Another interesting phase change I witnessed was LN2 to solid N2. I made that by pulling a vacuum on LN2 in a petri dish, viewed through a plastic cover on the vacuum chamber. The N2 forms an interesting souffle as an ice crust is lifted by gas underneath. Another ice layer forms below the first ice layer. The process repeats until the liquid is gone. The solid, liquid, and gas states of N2 were all present and apparent at the same time. I don’t know why they were surprised……. These are interesting discoveries, but we need to remember that the best estimates of volcano CO2 emissions place them as less than 1% of current human emissions. See http://volcanoes.usgs.gov/hazards/gas/index.php, “Volcanic Gases and Their Effects” by USGS. So, even if there were twice or three times as many volcanoes erupting as we know about, their CO2 emissions would still be far less than ours. Chadwick and colleagues have been keeping tabs on the peak since it last erupted in 1998. Thanks to a monitoring system they developed to measure the mountain’s minute movements, the team predicted the volcano was due for another eruption sometime between 2011 and 2014. “So for me, it’s a very exciting thing that this worked!” Chadwick said. The discovery came as a surprise, as researchers attempted to recover instruments they’d left behind to monitor the peak a year earlier. When the researchers hefted a seafaring robotic vehicle overboard to fetch the instruments, the feed from the onboard camera sent back images of an alien seafloor landscape. Where was all the earthquake reading on this? Following the link in the article about microbes leads to this article about microbes inhabiting the deepest crust layer and feeding on hydrocarbons. Guess the Russians are correct on oil production from the core and I wonder how this affects the story on life from comets and asteroids. There are three millions of the things, per recent 2009 estimates. I’ve commented here numerous times with links that I’m too busy this morning to list again. Search on millions subsea volcanoes. LazyTeenager says: I suspect that volcanoes are highly variable in the amount of CO2 they produce. The undersea ones are likely not gassy depending on the magma source. Interesting assertion. Check out the CO2 production of the deadly Lake Nyos vent, which killed 1700 people with CO2 emissions. Bubbles of liquid CO2: If the CO2 is liquid, it would be in solution with ocean water. Would there be any bubbles? Thanks for the explanation, Mike. Doubly interesting, in that rift-derived magmas, especially like those that drive Lake Nyos, are very high in CO2…and the mid-ocean smokers are kin to this process. Try millions more, for one. The groundwater flux at the midocean ridges is massive and continuous…and the process falls under ‘vulcanism’. Obviously, it’s WORSE THAN WE THOUGHT! Immediate action is needed! …as an aside, I most certainly miss J. Tuzo Wilson. I wonder what he’d have to say about some of this…I had the privelege of hearing him lecture at the University of Toronto many times before his passing in 1993. A quiet, gracious, and undeniably brilliant man. I believe that figure is a figment of the collective imagination of a bunch of eccentric vulcan(ist)s. The current state of under water volcanoes seem to be in the range of 150(0) to 15,000 to somewhere around 35,000 to a bazillion … or there about. Apparently it is all about the extrapolations being done. Is it the Hoockey-schtick-Mann technique or the Hansen’s super online Schmidt add-on trick? I have his paper on transform faults in my ancient copy of Cox (1973) Plate tectonics and geomagnetic reversals. My geophysics lecturer Fred Vine is in there too. Some time back I tried to find out about where and how many there were, including vents. I hope I am not beating a dead horse, but I was looking because I suspected there was some tie-in between the vents and ENSO. I’ve looked high and low to see what the evidence is for the source of the El Niño heat along the Pacific at the equator. Coincidentally or not, SOME of the known vents are positioned well to do just that – add heat right in the eastern Pacific. Right now it just looks like coincidence, but if more are found then more heat would be added to whatever is normally going on there. It MIGHT be significant, though the current evidence doesn’t seem to indicate that. So, this headline really perked my ears up. But the additional heat at the moment doesn’t seem all THAT much (for now). The ENSO-vent connection may just be me looking for connections where there aren’t any. But the heat source for El Niño isn not known at present. I’ve only read one article which even addressed it at all. That one states that they believe the heat is somehow stored below and then it comes to the surface cyclically. While plausible, that appears to only be a best guess. It did not describe what mechanism caused the storage regime (La Niña) in the cycle and what caused the release regime (El Niño). Similarly, if the vents and vulcanism are happening, there has to be a mechanism that explains the oscillations of heat storage and release. A few things mentioned here argue against the idea. One is that the volcanism described here is not near the Pacific Equator, but in Oregon and Antarctica. Now, most of the Pacific equatorial area is within the central region of the Pacific Plate, so is not known as highly volcanic. However the western end is certainly in the Ring of Fire, while the vents are in the east, near SA and almost directly on the Equator. So, both ends are at least slightly affected by volcanism, even if it is not in itself cyclical. If currents shift, or undersea volcanism is found to be cyclic, perhaps this heat energy is dissipated sometimes and not at other times. That would have the effect of focusing the heat or not. There is a LOT to learn yet about the ocean floor. We WILL have surprises. But what do they mean, when taken all together? I would say that those talking about CO2 from the volcanism might be missing what I think is the more likely probability that the direct additional heat energy doesn’t need CO2 as an intermediary. Heat is heat and doesn’t need CO2 to take the long way around – traveling all the way up to the stratosphere to indirectly add heat down below. We’re both fortunate! I wonder if Bob Ballard will ever weigh in on an estimate of black smokers worldwide? Most of the moutain-like volcanoes have been discovered. How often they erupt is another thing all together. EXACTLY!!!! Pamela, Just look at how well the C02 graph fit’s with the INCREASED volcanic activity here. Microbes, huh. I’m reading Tommy Gold’s “The Hot Deep Biosphere”. Looks like he was right again. Several here have commented on the amounts of heat and CO2 emitted by underwater volcanoes. But in the context of the AGW hypothesis, the emission of sulphur from undersea volcanoes is much more important. Let me give you one (of several) possible scenarios where there is no change to the sinks and sources of CO2 but the observed recent increase in atmospheric CO2 concentration results. There is an equilibrium of CO2 concentration in the air and in the ocean surface layer. And the oceans exchange (in both directions) tens of times more CO2 than the anthropogenic emission of CO2 in each year. The system is buffered (mostly by dissolved calcium compounds) so cannot change much in the absence of a temperature change or a change to the pH of the ocean surface layer. (i.e. no changes to sources or sinks and no additional or anthropogenic CO2 in the system). Then what pH change would induce the rise in atmospheric CO2 concentration which we have observed? A reduction of only 0.1 in pH would be more than sufficient and is much, much too small to be detectable. Could such a change have happened despite the buffering and, if so, how? Yes, it could. Water travels in the depths with the thermohaline circulation for centuries before it returns to the ocean surface layer. Water that travels past under-sea volcanism will dissolve sulphur ions which reduce its pH. This low pH water will reach the ocean surface centuries later and thus will reduce the pH of the surface layer with resulting increase to atmospheric CO2 concentration. 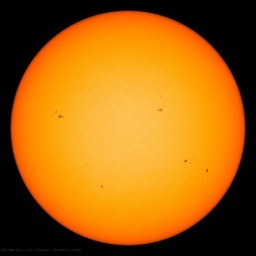 This is but one of several possible scenarios whereby there is no change to sources and sinks and the increase to atmospheric CO2 being entirely natural and with the anthropogenic emission being irrelevant. Nobody can know if this volcanism conjecture is the correct explanation for the rise in atmospheric CO2 concentration but it is at least as likely as the conjecture that the anthropogenic emission is the cause. But this volcanism conjecture explains more than the conjecture of an anthropogenic cause for the CO2 rise. The rise in atmospheric CO2 concentration is induced by a variation in the quantified anthropogenic CO2 emission which causes a postulated and unknown effect on the carbon cycle. The rise in atmospheric CO2 concentration is induced by a variation in the unquantified undersea volcanic sulphur emission which causes a known effect on the carbon cycle. Neither conjecture is likely to be the explanation of the major cause of the observed rise in atmospheric CO2, but both conjectures are probably right in that the effects they describe affected the rise. Quite apart from the heat from submarine volcanism, might not a more important consequence of decades or centuries-long emissions of carbon dioxide from the many smokers, volcanoes and other vents on the sea floor explain, at least partially, the 2ppmv annual rise in atmospheric carbon dioxide?. ie. is the anthropogenic source of carbon dioxide vastly overstated? Stable at abyssal pressures and temperatures, all it needs to release this gas is upwelling which will reduce pressures and increase temperatures sufficiently, in many places, to oversaturate sea water in CO2, leading to its release. Upwelling is a feature of many of the periodic oscillations of ocean temperatures. Gas is compressible. As you compress it, the gas will become more and more dense. Eventually it will have the same properties as the liquid. That point of pressure and temperature is called the critical point. The CO2 phase diagram is also interesting in that at atmospheric pressure, CO2 does not exist as a liquid. It can only be a gas and a solid. So, you can buy a pound of solid CO2 down at the Mega-Mart, but you can only buy liquid CO2 in a steel cylinder under pressure, e.g a CO2 fire extinguisher. At atmospheric pressure, the “dry ice” doesn’t melt: it “sublimates”, i.e. converts directly from a solid to a gas. And if you have ever discharged a CO2 fire extinguisher you would have seen CO2 “snow” which just disappears. Cool. In an emergency, miscreants have been known to discharge a CO2 fire extinguisher into a bucket of cans of beer to cool them. But only in an emergency. “Massive” volcanoes only come from massive eruptions that release massive amounts of previously sequestered into the ecosphere, as compared to what happens to the carbons in trees burned in a forest fire. None of this new “massive” is factored into models and if “massive” is massive enough, it will just invalidate them. But if no one discovers the “massive” evidence, will it ever matter to the IPCC? I think nothing will deter them from their quest to destroy our liberty and prosperity. that might be something they need to take in account in determining the human contribution to the atmospheric CO2 content. The pastafarian colors not withstanding, but it’s an interestingly detailed image that show two of the peaks having collapsed. What would the effects have been above ground had it not been for all that water pressure holding the forces all back? A more accurate title might have been “Undersea Volcano erupts as predicted”.